Here’s our handpicked selection of the best kid-friendly happenings over the coming days. Snow White & The Seven Dwarfs: This year’s panto at the Cork Opera House is as high-octane as ever, with all the singing and shouting and amazing dancing that we’ve come to expect from one of Cork’s largest theatres. This is a brilliant family affair. Suits: The whole family. Time: Saturday 2pm & 7pm, Sunday 1pm & 6pm. Tickets: From €27.50. Book here. 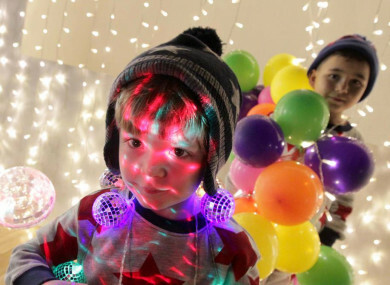 Glow Festival: Glow returns to Smithfield Square this Saturday for another year of free family shows, workshops, comedy and music. There’s an appearance from Lords of Strut and, for the artistically inclined, an alien doodling workshop with Lonely Beast creator Chris Judge. Plus loads more! Suits: The whole family. Time: Saturday 2-6pm. Tickets: All activities are free. For more info, click here. Aladdin: Mill Productions are presenting their version of Aladdin at the Mill Theatre in Dundrum this weekend. This mid-sized theatre is a brilliant introduction to the amazing fun of panto, for small kids in particular. Suits: The whole family. Time: 12pm, 2pm and 4pm. Tickets: €55 per family. Tickets here. ET with the RTE Concert Orchestra: This screening of Steven Spielberg’s family classic will definitely appeal to parents and kids alike, and there’s orchestral accompaniment to add to the drama. A ticket to this performance is quite frankly, essential. Suits: Age 6 +. Time: 7.30pm. Tickets: from €29.50. Find out more here. Christmas Open Day @ The National Museum: Step back in time this Sunday at Collins Barracks where there’ll be carols and story-telling and historian Regina Sexton will be on hand to tell you all about the origins of our festive food. Suits: The whole family. Time: 2pm-5pm. Tickets: Free. Find out more here. Miracle On 34th Street: Treat your kids to a showing of the original Miracle on 34th Street this Sunday at the Town Hall Theatre. Starring Maureen O’Hara and Natalie Wood, it’s a super way to kick of Christmas movie season. Suits: Age 6 +. Time: 3.30pm. Tickets: €6 for children, €8 for adults. More information here. A Fairy Good Christmas: Super interactive and incredibly fun, this story centres around a time when the good fairy Golden Ember has her magic taken by the King of the Rats, King Ratzee and needs help from the audience to find it. Suits: 3 – 8 years. Time: Saturday and Sunday 11am, 1pm, 3pm and 5pm. Tickets: €12. Tickets here. Want to win a stylish festive break at Dublin’s Trinity City Hotel? Enter here – and don’t forget to follow us on Facebook and Twitter! Email “7 festive family events to check out this weekend - from Snow White to story-telling”. Feedback on “7 festive family events to check out this weekend - from Snow White to story-telling”.